Update: Just realised the post in question is nearly four-and-a-half years old. Apparently, though, it’s OK for a “scrapbooker” to make a six-figure annual salary, but not a piano teacher. We tend to let people alone here at Piano & Synth Magazine, but when we read this rant (passed on to us by Keyboard Magazine (Facebook link) we felt compelled to respond. Firstly, let me just say that I’m not a piano teacher, but, as a child, I was fortunate enough to train under two excellent private teachers. Yes, my parents had to pay, but for me, it was the best musical training I had available. I’m all for the arts. “Arts”. All lumped in together. That’s like saying “I’m all for the sciences”. I try to encourage my kids to express themselves: I hang all their “masterpieces” on the fridge, I listen to their kazoo solos, and I even let them play with Play-Doh (though I hate the stuff). 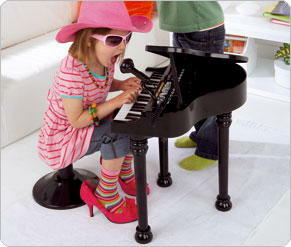 But I had to balk when my nine-year-old told me she wanted to play the piano. Quite apart from the fact you’re disrespecting your child’s artwork (it may not be amazing to the general population, but you’re their parent, so it should be amazing to you) you seemed to have an aversion to letting your daughter experiment with musical ‘art’ right off the bat. It wasn’t the playing, per se. It was the learning. Why is it so darned expensive to hire a piano teacher? Well, I know the answer, but let’s save that until the end. Now, I’m a writer, so I know the myth of every novelist living in an unheated garret is far from the truth (my garret is heated quite nicely, thank you). So I figured the myth of the starving musician was equally false. But then I started looking into hiring a piano teacher. So you’re happy to perpetuate another ‘artist’ trade (writer) not being paid what they’re worth, but not the ‘music teacher’ one? As a matter of interest, how much do you charge, or expect to make, from your writing? If you haven’t been in the market for someone to teach little Kendall or Kyler “Chopsticks,” brace yourselves. More disparaging comments about teachers. I’ve not met a single piano teacher who has taught “Chopsticks” to anyone. “Chopsticks” is extremely annoying and of minimal learning benefit. You thought you had it bad, saving for college. Forget that – the going rate for music teachers is A DOLLAR A MINUTE. To foot the piano bill, I’d have to trade in my high-rent bi-monthly hair cut for Great Clip’s $9.99 Thursday special. You heard me, $60 an hour. Which computes to about $120,000 a year, assuming the teacher is busy 40 hours a week and gets time off for good behavior. Most piano teachers are self-employed. This means that (a) they’re probably not working a 40 hour week. They don’t get paid if they go on holiday. They have to do all their own taxes, insurances, medical, pension and so on. They have the cost of upkeep of the piano (if it’s acoustic) or updating a digital piano to be good enough to teach from. There’s also the fact that they had to pay money to have lessons, attend music college, and so on. Sadly, some of these facts are overlooked when it comes to anyone who is self-employed. The employed ‘elite’ either don’t realise, or don’t care, how much work goes into maintaining a sole trader business. These sound like quite low rates for a lot of those professions. I wouldn’t have a clue how much a logger makes, but psychologists in the UK make far more than that. First question: Why do the out-of-work musicians (i.e., piano teachers) make more than the in-work (i.e., performing) ones? Just something to think about. This makes a couple of assumptions. Many musicians – teachers, performers, and those who do both – also take on additional work to make ends meet. Most ‘careers’ in music are low paid. In fact, most ‘careers’ in the artistic world are low paid. Oftentimes this is because clients/customers/the general public think creative people shouldn’t charge significant money for their art/knowledge/training. Granted, it can be quite stressful for the teacher when Flynn hasn’t practiced her scales. More disparaging comments. Music teachers don’t charge “danger money”. You do need specialized training to teach music. Glad you finally acknowledged this. There’s no job security or benefits. But c’mon, the physical risk is low, and the overhead even lower. What do you know about ‘overheads’. That’s like me telling you that your overheads are ‘a couple of packs of biros every month’. Insulted? Can piano teachers honestly say that their job is really almost FIVE TIMES as much work as it is to get two bison to mate in a timely and productive manner? Quite where the bison came from I’ve no idea. You could extend the argument and look at professional sports players, movie stars, pop singers… Are they paid based on how much ‘work’ they do? Another point: It’s not like I’ve got Mozart on my hands here, either. Chances are, Kinsey has inherited her parents’ tone-deafness and will take a few months’ of lessons and then move on to greener pastures – ice hockey, maybe, or knitting (both cheaper options, by the way). Any sidewalk musician could probably teach her to identify her notes and bang a few chords. Actually, that’s not a bad idea. Instead of playing for pennies outside the Red Line subway station, I bet I could convince them to help my daughter for $20 and a hot meal. And if (and that’s a big “if”) Kinsey makes it through this introductory period, practices on her own, and shows some talent and dedication, then I’ll break out my wallet for the big guns. Alternatively, many home keyboards feature basic onboard tutorials. There are also online games and tablet apps which can be used to teach basic music theory and playing technique. Music, and its creation, is meant to be enjoyed. Registered piano teachers serve an extremely useful market for those who need them. Not everyone does. Granted, not everyone can afford them, but then that’s true of so many hobbies and pastimes which require training from professionals. Please stop picking on skilled, creative people who are trying to make a living like the rest of us.